For the Indian civil servant and historian, see Robert Warrand Carlyle. For those of a similar name, see Robert Carlisle (disambiguation). Robert Carlyle OBE (born 14 April 1961) is a Scottish actor. His film work includes Trainspotting (1996) and its sequel (2017), The Full Monty (1997), The World Is Not Enough (1999), and Angela's Ashes (1999). He has been in the television shows Hamish Macbeth, Stargate Universe, and Once Upon a Time. He won the BAFTA Award for Best Actor in a Leading Role for The Full Monty and a Gemini Award for Stargate Universe, and was Emmy Award-nominated for his work in Human Trafficking (2005). Carlyle became involved in drama at the Glasgow Arts Centre at the age of 21 (having been inspired by reading Arthur Miller's The Crucible), and subsequently graduated from the Royal Scottish Academy of Music and Drama (RSAMD). In 1991, he and four friends founded a theatre company, Raindog (which was involved in television and film work). The same year he guest starred in The Bill and also starred in his first movie, Riff-Raff, directed by Ken Loach. In 1994, he played the gay lover of Father Greg in the film Priest. Carlyle's first high-profile role came as murderer Albert "Albie" Kinsella in an October 1994 episode of Cracker opposite Robbie Coltrane and Christopher Eccleston (notoriously killing off Eccleston's character, DCI David Bilborough). This highly acclaimed role showcased Carlyle's "pure intensity". Shortly after his appearance in Cracker, he landed the role of Highland policeman Hamish Macbeth in the BBC comedy-drama Hamish Macbeth. The series ran for three seasons from 1995 to 1997. In 1996 and 1997, he appeared in the two highest-profile roles of his career to date: as the psychopathic Francis Begbie in Trainspotting and Gaz, the leader of a group of amateur male strippers, in The Full Monty. The latter earned Carlyle a BAFTA Award for Best Actor in a Leading Role. He also starred with Ray Winstone in the 1997 film Face. Carlyle played the senior Malachy McCourt (father of author Frank McCourt) in the 1999 film adaptation of McCourt's first memoir, Angela's Ashes; the arch villain Renard in the 1999 James Bond film The World Is Not Enough; and a cannibalistic soldier in the 1999 Ravenous. Robert Carlyle in July 2009. Carlyle appeared in the 2002 Oasis music video for "Little By Little". He played Adolf Hitler in the 2003 miniseries Hitler: The Rise of Evil. In 2006 he played the villain Durza in Eragon. In 2007 Carlyle played one of the main characters in the film 28 Weeks Later. He also played the lead role as a marine engineer attempting to save London from total devastation in the disaster film Flood. That year he also portrayed Father Joseph Macavoy in the film The Tournament. In 2008 Carlyle narrated a BBC audiobook version of The Cutting Room. In 2008, he was cast as Dr. Nicholas Rush in the television series Stargate Universe. His role in the series has been described thus: "As [the team fights] to survive, Dr. Rush (Carlyle) works to unlock the mysteries of the ship and return the group home, but evidence of his ulterior motives soon arises." His was touted by the studio as the "leading role" in Universe. In December 2008, Carlyle appeared in 24: Redemption, a television movie based on the popular TV series 24, starring alongside Kiefer Sutherland. In 2009, Carlyle appeared in a long-form commercial for Johnnie Walker whisky, titled "The Man Who Walked Around The World." Carlyle was shown walking down a path and talking for six minutes in a single long take. The ad took two days to film. The director, Jamie Rafn, afterwards referred to Carlyle as an "utter genius". He voices the character of Gabriel Belmont, and his counterpart, Dracula in the video game Castlevania: Lords of Shadow, as well as its sequels Mirror of Fate and Lords of Shadow 2. From 2011 to 2018, Carlyle portrayed Mr. Gold (Rumplestiltskin) in the fantasy-drama television series Once Upon A Time. The character is a wizard, deal-maker, and master manipulator. In 2018, Carlyle will portray Ogilvy in a three part television adaption of The War of the Worlds for the BBC. Known for his commitment to authenticity in roles, Carlyle has often altered his lifestyle and physical appearance to gain a better understanding of a character; much akin to method acting. Before playing a homeless character in Antonia Bird's Safe, for example, he went to live in the Waterloo area of London where the film was set. For his role as a bus driver in Ken Loach's Carla's Song, he passed the test for a PSV licence (a licence to drive a bus with passengers) in a Glasgow Leyland Atlantean bus. Carlyle also removed two of his teeth before reprising his role as Begbie in T2 Trainspotting. Writing of Carlyle's performance in The Full Monty, Andrew Johnston stated: "Carlyle was brilliant as the savage psycho Begbie in Trainspotting; here, he proves he can be almost as good when kept on a short leash. We don't know much about Gaz, but he's the most interesting character in the movie, largely because of Carlyle's down-to-earth warmth." Carlyle has been married to make-up artist Anastasia Shirley since 1997. They have three children: Ava (born 2002), Harvey (born 2004), and Pearce Joseph (born 2006). The family lives in Glasgow. Carlyle is a patron of School For Life in Romania. Carlyle supports Rangers F.C..
1990 Taggart Gordon Inglis Episode: "Hostile Witness"
1991 The Bill Tom Ward Episode: "The Better Part of Valour"
1993 Screenplay Nosty Episode: "Safe"
1994 99-1 Detective Constable Trevor Prescott Episode: "Doing the Business"
2002 Oasis "Little By Little"
^ "Robert Carlyle OBE". Once Upon A Time FAns. Archived from the original on 27 November 2013. Retrieved 27 November 2013. ^ "Robert Carlyle OBE". Google sites. Retrieved 27 November 2013. ^ "Robert Carlyle Biography". FilmReference. Retrieved 30 December 2008. ^ "Born Equal: Robert Carlyle". BBC Press Office. BBC. 15 November 2006. Retrieved 30 December 2008. ^ Pendreigh, Brian (29 January 2006). "Father's death causes Carlyle to quit movie". Scotsman.com News. Retrieved 30 December 2008. ^ Smith, Andrew (28 March 1999). "Method man". The Guardian. Retrieved 30 December 2008. ^ Armstrong, Stephen (20 May 2007). "On the Move: Robert Carlyle". Timesonline. Retrieved 5 April 2009. ^ Sweet, Matthew. "The Saturday Profile: Robert Carlyle, Actor: A man for all regions". Independent. Independent. Retrieved 27 January 2017. ^ Sumner, Darren (15 December 2008). "Robert Carlyle cast in Stargate Universe". GateWorld. p. 1. Retrieved 30 December 2008. ^ Sumner, Darren (15 January 2009). "Brian J. Smith cast in Stargate Universe". GateWorld. p. 1. Retrieved 15 January 2009. ^ Sumner, Darren (15 December 2008). "Robert Carlyle cast in Stargate Universe". GateWorld. p. 2. Retrieved 30 December 2008. ^ Jeffery, Morgan (5 April 2018). "Here's your first look at BBC One's War of the Worlds". Digital Spy. ^ Armstrong, Stephen (20 May 2007). "On the Move: Robert Carlyle". Times Online. Retrieved 30 December 2008. ^ Leigh, Danny (8 January 2017). "Robert Carlyle: 'I took out two teeth and suddenly Begbie came back to life'". Guardian. Retrieved 31 January 2017. ^ Time Out New York, 14–21 August 1997. ^ "Skibo: The Full Monty". BBC News. BBC. 19 December 2000. Retrieved 15 July 2014. ^ "School For Life Romania". Retrieved 30 December 2008. ^ "Scots actor Robert Carlyle on missing creature comforts when working in Canada". Daily Record. Daily Record. 9 October 2010. Retrieved 9 October 2010. ^ "British Academy Scotland Awards: Winners in 2015". www.bafta.org. Retrieved 9 May 2016. ^ "Scottish Bafta nominations announced – BBC News". BBC News. Retrieved 9 May 2016. ^ "T2 Trainspotting big winner at Scottish Baftas". BBC. 6 November 2017. ^ "The Man Who Walked Around the World". Retrieved 11 October 2009. 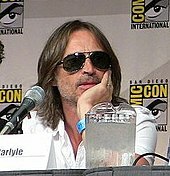 Wikimedia Commons has media related to Robert Carlyle.